A year ago, I talked about the Irish cream-flavored items that Dunkin Donuts was doing and a couple of candles. I have no food this time but I’m back with another round of St. Patrick’s Day-inspired candles! 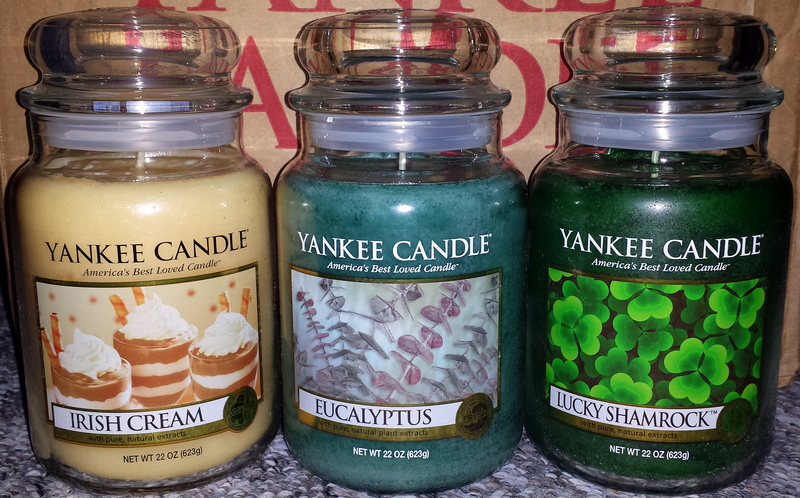 Yankee Candle’s website was a having Buy 2 Get 2 Free sale and I couldn’t pass it up. I decided to be a wee bit festive and picked up their Lucky Shamrock and Irish Cream candles. I picked up Eucalyptus as well and the fourth candle is Wild Sea Grass (not pictured). Lucky Shamrock smells like one of YC’s summer candles called Summer Wish but I’m not sure if they are exactly the same. I know Yankee has sometimes re-labeled candles to fit a certain season or holiday. Both have a very nice clean smell to them but they both also suffer from the same problem of their scent not being very strong. I had Lucky Shamrock lit for a few hours to the point where the entire top layer had pooled. I was sitting right next to the candle. I could barely smell it. Nice scent, but not recommended because it’s extremely weak. With Eucalyptus, I fared a bit better. I’ve never noticed this one before but I read a customer review online that stated YC carried it for years and years and they have apparently just recently brought it back. It’s another good clean smell and I was most interested in it because the reviewer stated it helped open her nasal passages. I’m not sure about that but I do like it. It’s got a much stronger scent than Lucky Shamrock but still a bit weak, I think. Irish Cream was probably the candle I was most interested in trying. Unfortunately, I think YC took either their Vanilla Cupcake or Buttercream candle and gave it a new label. So that was disappointing. But hey, you don’t know until you try, right? I’ll still burn through all of these candles but so far I’m liking Eucalyptus the best.